Soukha Kachittavong has defeated a field of 191 entries to take home his second World Series of Poker Circuit (WSOPC) ring, and $14,898. Not only did Kachittavong secure a second ring today, but he won his second ring in the same series. Just four days ago, Kachittavong took down Event #8 ($365 No-Limit Hold’em) for $14,274. After his first win, Kachittavong said that he had a ring prop-bet for this series, and that a friend laid him 7:1. “I only had one prop bet. I was feeling confident, but I wasn’t feeling that confident,” he concluded with a smile. After falling just short two times in a row, Jeremy Meacham is now a World Series of Poker Circuit ring winner. Meacham won the Main Event at Foxwoods, earning $156,735. Meacham is a 30-year old professional poker player from Oak Bluffs, MA. Meacham has a very special history with Foxwoods casino, and specifically the World Series of Poker Circuit (WSOPC) Main Event at Foxwoods. The last three years Meacham has not only cashed this event, but has final tabled it. In 2015 he placed 6th for $28,556, in 2016 he took 3rd for $66,930, and today he finally secured the win for $156,735. Meacham ended Day 1A as the chip leader with 289,000. He was nearly the overall chip leader heading into Day 2, except poker pro Galen Hall inched just ahead of him in Day 1B when Hall eliminated Meacham’s brother Henry the last hand of the night. Meacham came into the final table second in chips with 1,500,000, just behind chipleader Mike Azzaro (2,690,000). Azzaro was ultimately eliminated in 4th Place ($52,488), and after the elimination of Bob Ricciuti in 3rd place ($70,713), Meacham went heads up with Sean Thomson. Heads-up play lasted just over two hours, and concluded when Meacham shoved all in with pocket twos, and Thomson called with ace-queen. Thomson flopped a queen, but Meacham flopped a set of twos to secure the win. Foxwoods was the second Circuit stop of the new season, and in addition to the prize money and the Circuit ring, Meacham also won a free entry into the 2017/2018 WSOP Global Casino Championship. The tournament started with 486 entries, and the top 54 made the money. 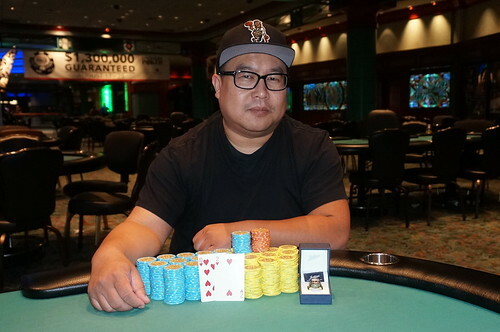 Other players finishing in the money include Christoher Leong (43rd Place), Dave Stefanski (39th Place), Greg Himmelbrand (27th Place), JeWook Oh (25th Place), Mike Dentale (18th Place), Cory Waaland (11th Place), Ralph Massey (8th Place), Galen Hall (5th Place) and Mike Azzaro (4th Place). After falling short three times this series, Caleb Clarke is now a World Series of Poker Circuit ring winner. Clarke won the High Roller event at Foxwoods, earning $50,625 and his first Circuit ring. Clarke is a 24-year old professional poker player from Mashpee, MA. Clarke started playing poker just three years ago, and he transitioned to a full-time professional player just one year ago. Clarke had a wonderful series at Foxwoods, securing not only four cashes, but four final table appearances. He started off his run taking 4th place in Event #4 ($580 Six Max) for $7,992, he then went on to take 8th in Event #6 ($580 No-Limit Hold’em). He thought he would finally secure a ring in Event #9 ($365 No-Limit Hold’em), but ultimately was eliminated in 4th place for $4,699. Today in Event #11, he was finally able to secure the win he had come so close to. “This was the fourth final table. The first three I came up a little short, a couple of them were a little brutal. I was happy to get some good scores in there, but I really wanted a ring this series, and after some pretty close calls it was great to finally take one down, especially in the biggest event that I played,” Clarke said after his win. Clarke finished Day 1 as the chip leader, but said that Day 2 he was relatively card dead, and that things didn’t pick back up for him until the middle of the final table. He eventually made it to heads-up play with Dave Stefanski, but it only lasted two hands. Clarke called Stefanski’s all-in holding top pair against Stefanski’s gutshot straight draw. Clarke held, and was awarded his first ring and the $$50,625 top prize. In addition to the prize money and the Circuit ring, Clarke also won 50 points in the Casino Champion race, and those additional points ensured him the free seat into the 2017/2018 WSOP Global Casino Championship event. Event #12, the $365 no-limit hold'em event, has reached the unofficial final table of Ten. The players have redrawn for their new seats, and are now playing level 21 with 5,000/10,000 blinds, and a 1,000 ante. Robert Palazzo leads the final ten players, with 254,000. The next closest players is Daniel Bunker, with 253,000. The remaining players are all guaranteed at least $1,088, and the first place prize is $14,898. Registration is closed for Event #12, $365 no-limit hold'em. This event drew a total of 191 entries, generating a prizepool of $57,300. The top 21 spots will get paid with a min-cash worth $636. The top spot will take home $14,898, the gold Circuit ring, and 50 Foxwoods Casino Champion points. Registration is closed for Event #11, $3,250 High Roller no-limit hold'em. This event drew a total of 45 entries, generating a prizepool of $135,000. The top 5 spots will get paid with a min-cash worth $14,,404. The top spot will take home $50,625, the gold Circuit ring, and 50 Foxwoods Casino Champion points. Players start with 10,000 in tournament chips. A full schedule of all August 2017 Foxwoods WSOP events can be found HERE. Day 1 of the $3,250 High Roller event at Foxwoods is now in the books. There were a total of 41 entries over the course of the first day, and by the end of the night, only 14 players remained. But the total number of entries, and Day 2 players, is likely to increase because registration is open until the start of play tomorrow at 2:00 p.m.
Caleb Clarke is the leader of the pack heading into Day 2. Clarke won a large pot off of Solomon Yi in the eight level of the day, jump starting his chip lead. Clarke rivered a flush against Yi's straight to get him to the 150,000 chip mark, and he held onto those chips, and built as the night went on. Yi held the early day chip lead in level 3 having hit quad fours to take out Zach Donovan and quad twos to eliminate Scott Mair just a few hands later. When Clarke joined Yi's table, Yi struggled for the second half of the day, and ultimately was eliminated in the last level of the night. The last female standing was Denise Pratt. Pratt was eliminated the first time when she shoved all in with A♦J♦ against Dave Stefanski holding A♠A♥. Pratt quickly re-entered and was seated at her son Jonathan's table. She stayed there until the second to last level of the night when she was ultimately eliminated by Brett Apter after flopping a set of sevens, Apter turning a flush and a straight. Pratt's son Jonathan is heading into Day 2 6th in chips (91,500). Jonathan lost a sizable pot the very last hand of the night when he called Houston Baker's all-in with kings, and ran into Baker's aces. Despite the late night setback, Jonathan still has a good size stack coming into Day 2. For a full look at all of the surviving players' chip stacks and seating assignments, please see the Reports tab on WSOP.com. Day 2 begins at 2:00 pm tomorrow, and will resume at Level 13 (1,000/2,000 blinds with a 300 ante). All prizepool information will be posted after registration closes. There were 81 players to start the day but only 9 were left at the end of Day 2. Players quickly played down past the money bubble, breaking it in the third level of the day. All in all it took just a little over ten hands and it was Jamey Kramer who was the unfortunate bubble boy. Kramer managed to survive once on the bubble by quadrupling up, but it wasn’t enough. His pocket sevens fell to Mike Azzaro’s queen-nine off suit and that would do it, brining the remaining 54 players into the money. That hand would also kick off a massive heater for Azzaro who eventually finished with the chip lead. He abused the bubble in a big way and increased his stack by several hundred thousand during that time, then picked up a second heater right on the verge of the final table, winning several big pots and eliminating players left and right. Jeremy Meacham is right behind Azzaro on the leaderboard. He made the final table of this event last year and finished in 3rd place, and will look to improve upon that finish on the penultimate day. Some notables who didn’t make it through the money bubble include Baseem Nsier, Pearce Arnold, and David Davenport each of whom was able to bag a big stack coming out of Day 1. But there were plenty more who made it into the money but not much further, such as Andrew Ostapchenko (40th for $3,061) who had a hot start early but failed to hold on to his chips, Jack Duong (29th for $4,301) who couldn’t out race Galen Hall and was eliminated, Long Tran (26th for $4,884) who made the final table of this event last year, and one of the Day 1b big stack Kevin Calenzo whose pocket jack fell to the hot run of Mike Azzaro (13th for $9,622). The final table bubble boy was Cory Waaland when Bobby Corcione and he fell in rapid succession. Waaland got it all in preflop with pocket tens, but they did not hold up against Hall’s ace-jack, and that brought the last ten players down to the final table. David Mock was the only player to fall after that. He was also eliminated by Hall when his pocket jacks ran into Hall’s pocket queens on a six high flop. The final nine players are all guaranteed at least $14,602 but area all gunning for the $156,735 first place prize as well as the WSOP Gold Circuit Ring. Play will resume tomorrow at 12 p.m. EST in level 26 with blinds of 15,000/30,000 and an ante of 5,000. Players start with 30,000 in tournament chips. Registration is closed for Event #10, the $1,675 no-limit hold'em main event. This event drew a total of 486 entries, generating a prizepool of $729,000. There were 189 entries in Flight A, and 297 in Flight B. The top 54 spots will get paid with a min-cash worth $2,770. The top spot will take home $156,735, the gold Circuit ring, and a seat into the Global Casino Championship event, with a $1,000,000 guaranteed prizepool. Players start with 20,000 in tournament chips. Robert ‘Bobby’ Corcione bested a field of 178 entries to win his first World Series of Poker (WSOP) Circuit ring, and $14,418. Corcione is well known in the Foxwoods poker scene, and is also known for his deep run in the 2012 $10,000 Main Event, for $294,600. Today Corcione can add Circuit ring winner to his already impressive resume. Corcione said that he felt confident coming into today, and his confidence was boosted by his father, who stood on the rail all morning long as his younger name-sake took home the title, and crossed into the Foxwoods Casino Champion lead. The $250 Ladies Event has reached the unofficial final table of Ten. The players have redrawn for their new seats, and are now playing level 14 with 3,000/6,000 blinds, and a 500ante. Karen Goncalves leads the final ten players, with 161,000. The next closest players is Andrea Willbur with 1513,000. A feature table of the Main Event Flight A is now streaming live at www.twitch.tv/foxwoodspoker. The table currently features Circuit regulars Cory Waaland and Wendy Freedman. Bobby Corcione has just won his first ring in Event #9 after defeating Richard Wible heads up. A full winner's story and recap will be posted later this evening. Richard Wible shoves all in for around 260,000, and Bobby Corcione quickly calls. The board runs out 9♦8♦7♦K♦7♣ awarding Corcione the pot, and eliminating Wible in 2nd place. Vincent Zacco has just been eliminated in 3rd place. Zacco takes home $6,413, and 30 Casino Champion points. Caleb Clarke shoves all in for around 50,000, and Richard Wible calls in the big blind. The board runs out 7♦2♦2♣A♥3♠ eliminating Clarke in 4th place for $4,699, and 27.5 Casino Champion points. The tenth of twelve Foxwoods ring events begins today at 12:00 noon. The $1,675 Main Event offers players a 20,000 starting stack, and 40-minute levels on Day 1. All players are allowed a single re-renty for each of the two starting flights, so if necessary, a player may buy in up to four times over the two starting days. Last year's Main Event at Foxwoods attracted a field of 460 entries, and generated a prizepool of $690,000. Julian Sacks of New Jersey took home the top honors, his first World Series of Poker (WSOP) Circuit ring, and $148,350. Samuel Taylor of New York, NY took home top honors the year prior (2015/2016), along with $149,020. Taylor has been spotted this series making deep runs once again. Prior to the start of this event, Taylor has cashed in three of the first nine ring event. It's most likely that he will also make an appearance for the Main Event. In addition to the cash prize, there is also a seat into the Global Casino Championship up for grabs for the winner of the Foxwoods Main Event. This seat allows the recipient to play in the $1 million guaranteed prizepool WSOP bracelet event held each year at the end of the Circuit season in August. Flight A begins today at noon. Any player that does not make it through to Day 2 from this first flight has another chance in tomorrow's Flight B, also at noon.